The W - One Question... - How fast can you type? Need to kill a minute this fine Friday? Can you type? 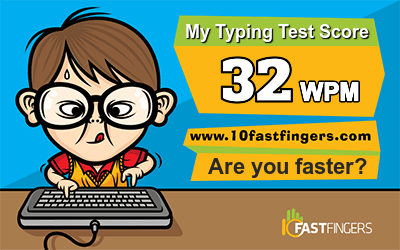 How FAST can you type? I want to try it again until I do it with zero errors (or crack the top 1000 - 1001st is such a tease), but that's not really how I operate in real life, and also my fingers hurt now. So I throw it open to you instead. [url=http://10fastfingers.com/typing-test/english] [/url]Visit the [url=http://10fastfingers.com/typing-test/english]Typing Test[/url] and try! WEIRD! My actual score was 64, but the (completely inaccurate yet flattering) image above says 150??? Somebody sucky should've gone first. EDIT: Well it said 150 YESTERDAY. Now I come back and it says 49? WEIRD. 82. I did not copy the picture, sorry. That was attempt #2. I got 111 and a few errors the first time. Reading five words ahead of what I was typing helped. So did completely ignoring the feedback - sometimes it flashes red even when you haven't done anything wrong? Next thread: Whats Your Dream Job? Well, my undergrad ceremony was fun because we got Peter Jennings as a commencement speaker and he gave a pretty good speech. Not much else sticks in my mind, though. At my first grad ceremony, I remember only two things. 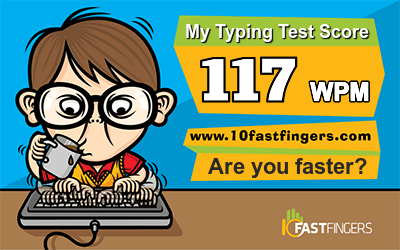 The W - One Question... - How fast can you type? Register and log in to post!